“What I have just written is false. True. Neither true nor false, like everything one writes about madmen, about men.” With these sentences, Jean-Paul Sartre undermines the truthfulness of his own autobiography, Les Mots. Undeterred by such circumlocutions, Andrew Leak here cuts through Sartre’s own disavowals to unearth the man behind the literary and philosophical giant. This biographical study integrates Sartre’s works into his personal life, revealing the intimate contexts in which his philosophy developed. From Sartre’s beginnings as a bright and precocious student, Leak explores how he struggled against the repressive strictures of bourgeois expectations, endured cruelty at the hands of schoolmates, and forged his conflicted personality within a fragmented family life. The book probes his particularly influential relationships with a range of people—from Simone de Beauvoir to Gaston Gallimard—and how Sartre was transformed by historical events, in particular his service in World War II. Telling anecdotes, personal correspondence, and archival photographs expose how Sartre’s own challenges emerged as predominant themes in his works—such as the often blurred delineation between the real and imaginary, and his preoccupation with definitions of “madness” in the individual. 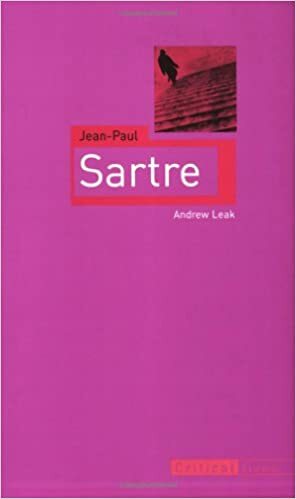 Leak’s astute and provocative examination of Sartre himself challenges the philosopher’s assertion about the limits of knowledge of the other.